Type, Manufacturer & Scale - Revell's old 1/32 Fw 190D-9 dating from the late '60s. Aim in this build - ENJOY THE BUILD! What stopped build? Good weather. What do you think would help you build get through to completion? Bad weather. First of all, I’d like to thank Chris K. (“Chris/Hanover”) for his gracious donation of a TON of Hasegawa parts, most of which were used for this build. Chris, I owe you one! 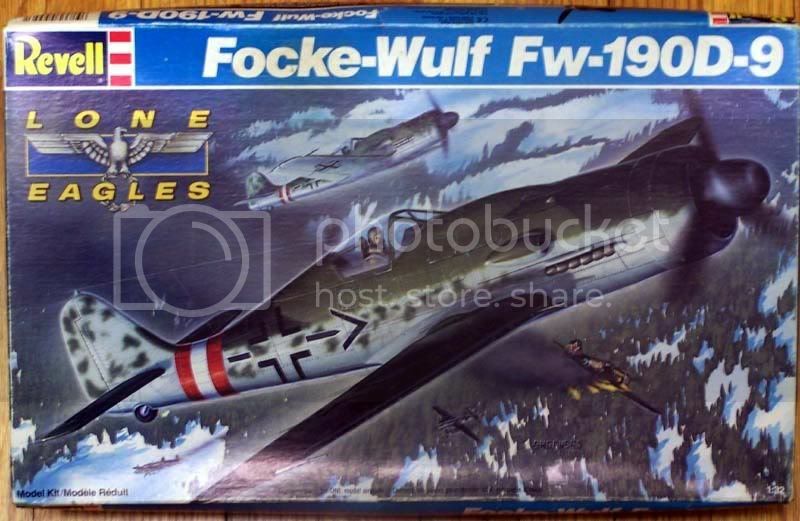 While Revell of Germany has reboxed the new-tool Hasegawa Fw 190D-9, this old Revell Fw 190D-9 dating back to the late '60s bears NO resemblance to the new-tool Hasegawa '190D kits at all. The overall shape is sort of ok, but it has noticeable shape problems along the top of the aft fuselage and front of the fin. Specifically, the top of the fuselage from the canopy back tapers down too much causing the fuselage to be about 1/16" too skinny top-to-bottom at the extension plug, and the fin extends forward at the root almost 3/16" beyond where it should be. 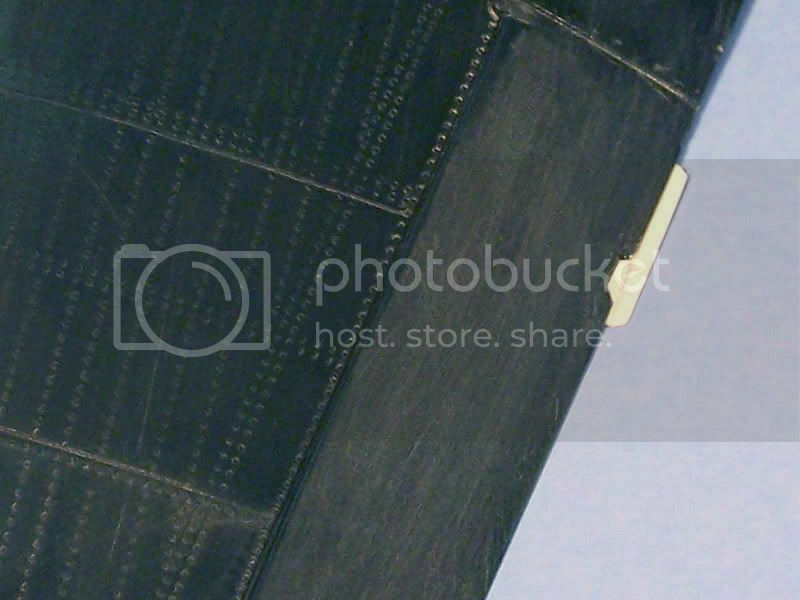 The visual impact of these errors is that the fuselage looks squeezed while the fin looks fat. Less noticeable is the fact that the wing incorrectly has considerable positive incidence (leading edge tilted up) causing the lines of the entire fuselage to be out of whack. The annular radiator's shape doesn't curve enough from front to rear, or inward toward the lip, giving the nose a kind of "beer can" shape. Had enough? Sounds like one for the trash can, right? Go ahead, if that's how you feel. But it can be built, and it is a fun, satisfying build as long as the builder has the understanding that the finished model will never be suitable for a contest table while remaining sane. Of particular value is using this kit as a test bed for detailing experiments, and/or as a basic canvas for practicing Luftwaffe camo. For this build, I chose to correct some failings and leave others as too bothersome. Those blanked off wheel wells were my biggest concern. To solve this, I made a mold of the Hasegawa ‘190D-9 wheel well insert and made enough resin duplicates of them for all of these old kits in my stash. 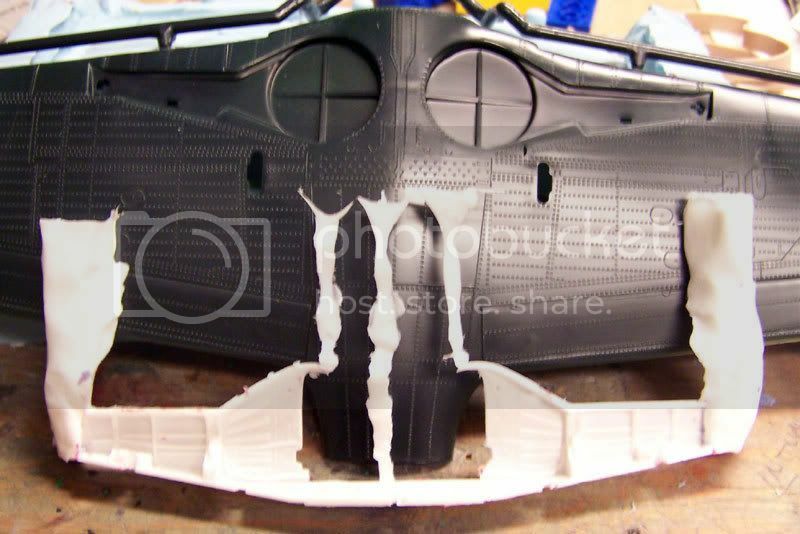 The pic below shows the nasty kit wells and the resin replacement fresh from the mold with the pour & vent stubs still attached. Once the blanked off wheel well area was cut from the kit’s lower wing, the copy of the Hasegawa piece fit like a glove with no further modifications. The kit’s landing gear mount bosses were left in place to ease installing the kit’s landing gear. Also shown in that pic is the modified headrest. 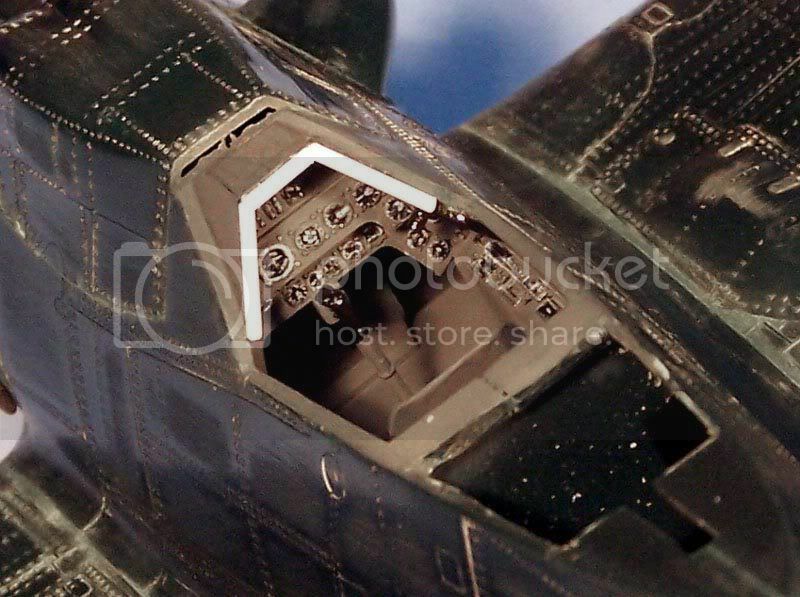 A Hasegawa headrest was installed on the kit’s canopy frame, and a piece of sheet styrene wrapped over the top to replicate the correct type support for the kit’s ‘blown hood’ type canopy. 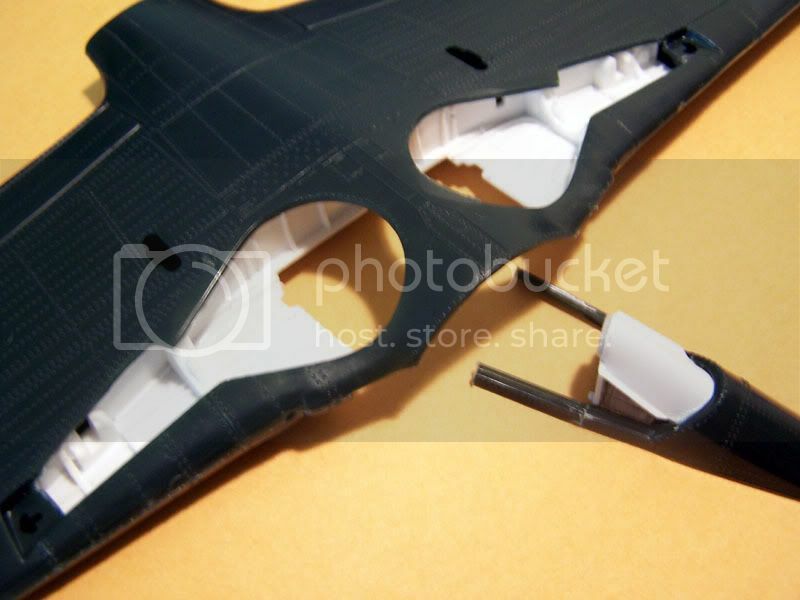 Also, the deck molded to the canopy frame below the headrest was cut back to the molded in notch. During that operation I managed to snap off one of the frame 'legs', but it was easy to glue it back on. 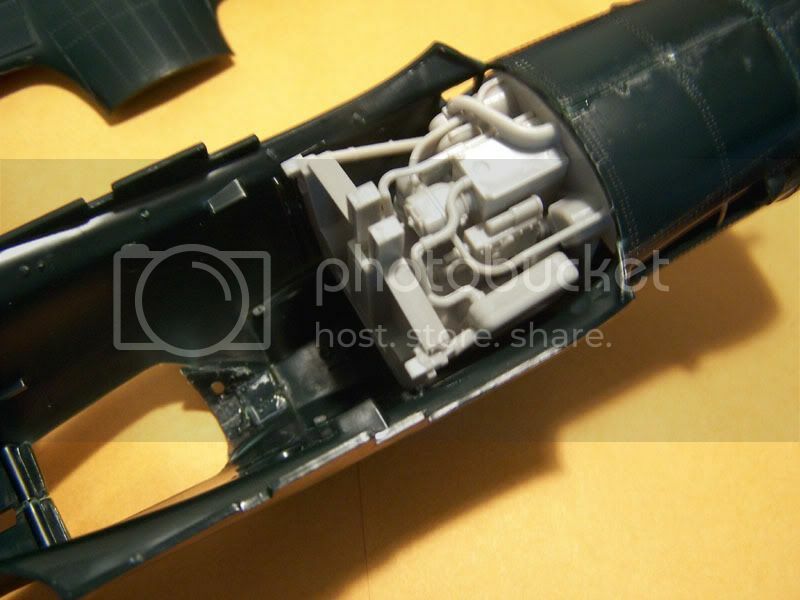 The engine accessory section and exhaust parts from a Hasegawa ‘190D-9 kit were fit into the Revell fuselage. Not much was required to get it all to fit, but the top of the section had to be narrowed by about 1/16” on both sides of the top. A little test fitting and tweaking were required to ensure the wing with its replacement wheel wells lined up properly with the accessory section. Two more posts to follow, the next in 30 seconds. After careful consideration, the kit’s cockpit tub and seat were used pretty much as-is. 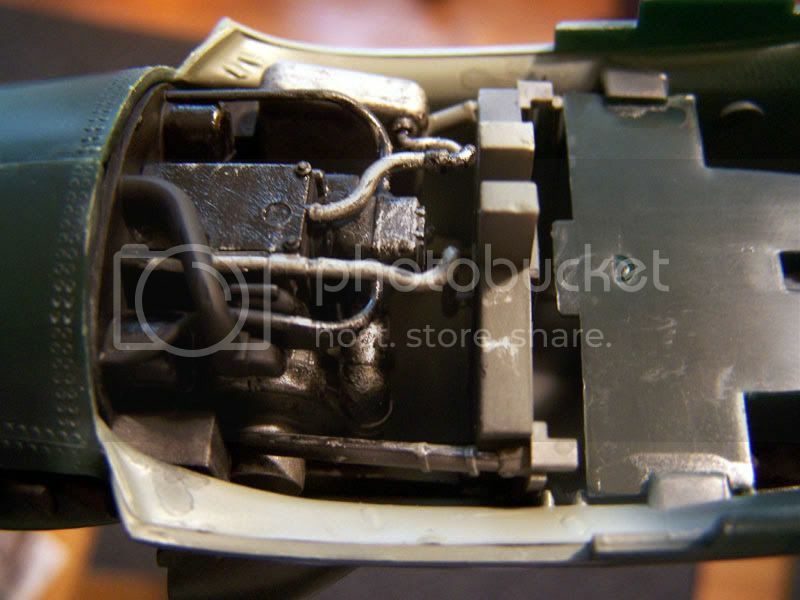 However, a Hasegawa instrument panel replaced the kit part, and a couple other Hasegawa detail parts were added (most notably the canopy crank handle). I think the next one of these I do will get the $11 True Detail '190 cockpit. The details were picked out by brush and drybrushing. The leather padding on the dash hood was replicated with .040” styrene rod. Still more to do in there, but that will have to wait until after the camo has been painted. After filing and sanding the trailing edges of the flying surfaces to a more acceptable edge, the kit's strange aileron trim tabs were filed off and replaced with .010" styrene sheet. These new tabs were cut so that they would also serve as fillers for the kit's funky notches in the ailerons. The ailerons, elevators and rudder were smoothed with 600 grit sand paper, then scuffed at opposite 45° angles to create a kind of cross-hatch surface similar to the fabric-covered surfaces on the real thing. The leading edge 'strakes' at the root are inaccurately shaped on the kit parts. A little reshaping of those with a file and putty eliminated the odd notches in the LE near the gun ports. And now, it is ready for paint. No rescribe job on this one. Although, the raised surface detail was toned down a bit with 600 grit paper. I find the raised detail to be easier to weather, and this kit's lines & rivets are laid out well within my tolerance for detail accuracy. The scheme I chose is Yellow 11 of JG2. My references for this particular bird are thin, so a lot of artistic license will be incorporated. Here’s a shot of the basic prefade/preshade/primer with RLM 70 and white. The areas with extra white are primed for the RVT bands, yellow 11and top wing crosses. Almost all of the markings will be sprayed on (very few decals). Some black has yet to be sprayed on for the underwing and fuselage crosses, as well as some darker shading around the engine access panels. Also note that the fade/shade does NOT follow every single panel and rivet line. Instead, these areas are randomly selected based what areas I felt were likely to be grimey or faded based on photographs of actual WWII Luftwaffe aircraft. Still lots of work to do at this point. I'm very glad to see this one joining the GB! It amazes me what some of you can do with a tired old kit like that. Great to see this one restarted D, and very interesting to see your progress shots. You humble me dude! Beautiful work. For my build, the only shape issue I corrected was the too-broad tail profile. Another problem I only noticed after assembly is that the dihedral is too flat - yours looks OK though, did you fix it? I love your fix for the trim tabs too. I had no idea what to do about those, so I left them as is. Thanks for the idea! The one area I still wish I had addressed is actually the horrible tail wheel. It really detracts from the finished model. Are you going to use the Hasegawa part D? I'm still putting my one of these off, too much work... you've got some great fixes though. Thank you very much for the kind words, guys! Another problem I only noticed after assembly is that the dihedral is too flat - yours looks OK though, did you fix it? The dihedral angle was automatically fixed by the wheel well piece. The wheel well has the 'spar' molded to it, and that re-set the dihedral angle. The upper wings fit rather tight against the fuselage, but required no trimming to assemble. The one area I still wish I had addressed is actually the horrible tail wheel. It really detracts from the finished model. Are you going to use the Hasegawa part D? Yep, I've got a Hasegawa tail wheel assembly to use for this one. The Hasegawa '190 kits all come with two tail wheels (large and small), so there should be plenty of these floating around spare. On the tail wheel; A horizontal brace needs to be installed inside the fuselage to provide a mounting point for the Hasegawa part. I just used a chunk of scrap spue long enough to fit between the walls, filed it to have a square cross section and drilled a hole in it for the mount pin to fit into. This piece was glued into the kit's existing mounting tab and is ready for the new tailwheel. To make your own, make sure it is about 1/8" square to get the Hase part to stick out the proper amount. Looks great, D! Lots of work you put into that beast, will definitely look nice finished!! 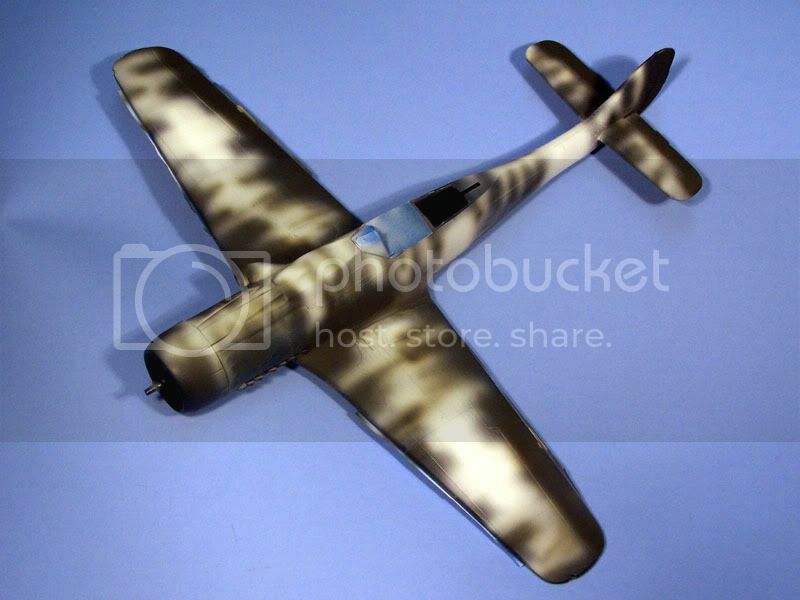 HI I don't know anything about Fw190s but yours is looking good in my humble opinion. 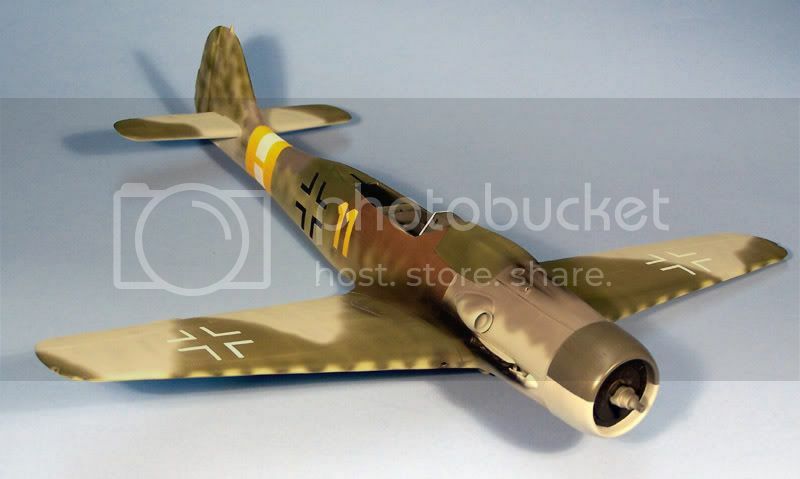 As always outstanding work my friend.I have several of the old Revell FW 190 D's in my to do pile,but it will be awhile yet.I've always loved that kit even if it takes alot of work. It is a good thing this is the 'stalled projects' area because this one is stalled yet again. Got myself talked into doing color tests for an earth tone and OD that look right together (to me) for an early P-40. Shouldn't take too long, but I always do these kinds of color tests with somewhat slapped together old 1/48 kits. Yes, it adds time to the process, but having the colors and decals actually on the correct shapes gives my eye a finer degree of color judgment. The final colors derived from these tests will go onto a Revell P-40E decked out in AVG livery like the historically incorrect original Revell P-40E's box art sometime soon after this '190D is done. HI Have fun and hope to see you back soon. This one goes 'till Feb so there will be time to finish! I often have a smaller scale kit going on the side also, but for me it's a stress reliever when the Big Kit gets me worked up. Very cool and I agree 100% with the sentiment. I was thinking about how your modelling philosphy might also reflect your motoring one. Just becasue its an old tool 1970's muscle car that has chewing-gum for brakes and cheese cutters for tyres doesn't mean you'll love it any less or not have fun driving it. Nice casting by the way...big pour gates and two part mould?